Suzuki know small 4×4’s, indeed the Jimny and Vitara were pioneers in the 1980’s bringing 4 wheel drive ruggedness to the masses. The only problem was that at that point the masses didn’t know that they needed four wheel drive to get to the shops. Fast forward to the present day and the concept of an affordable small SUV should be a licence to print money. Unluckily for Suzuki the huge upswing in interest in small 4×4’s has been accompanied by an equally big increase in competition which means that the latest Vitara needs to be good. To keep the affordable price tag this is essentially an SX4 S-Cross with a boxier body. This isn’t a bad starting point but is it enough to tempt buyers from mainstream rivals? There are certainly some promising elements. Thanks to the compact dimensions and car derived underpinnings, the Vitara is light and this makes it agile and efficient. It also makes the most of the modest power available from the 1.6 DDiS. A further benefit is that the suspension is compliant enough to cope with daily tasks as the engineers haven’t had to quell undue body roll. It isn’t all good news however as there is evidence of how Suzuki has kept the price down. The interior is workmanlike but lacks the finesse UK buyers are used to, the exterior is no horror show but equally won’t win any beauty competitions, and whilst the performance is fine there is a lack of refinement at low revs and when accelerating with any gusto. 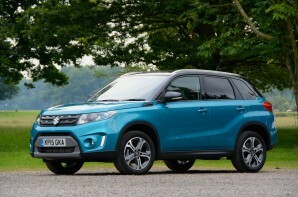 Ultimately the Vitara offers part time 4×4 ability and looks for a reasonable budget. Indeed this is what the Vitara has always done. What it doesn’t do is match the refinement and kerb appeal of the best in this class. If this doesn’t matter to you, then you can be safe in the knowledge that this is one of the more entertaining 4×4’s to drive and offers great fuel consumption on a budget.